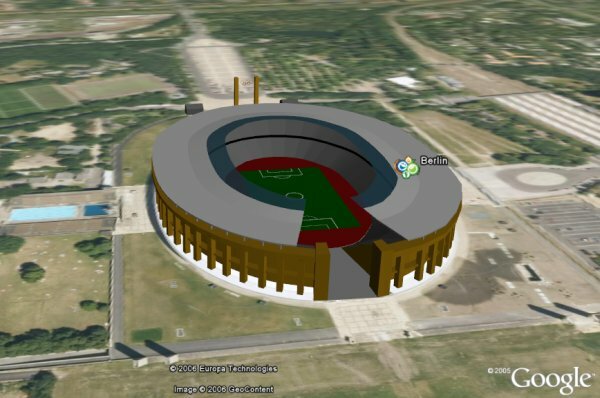 A new blog called OrangeTea, by a Dutch Company, is dedicated to Google Earth information . They have started off by promoting a collection of the twelve 2006 FIFA World Cup football stadiums in Germany. NOTE: You have to turn off the "Terrain" layer to see them properly. The placemarks provide information on which games are scheduled to occur in each stadium. The models are a nice compromise between detail and complexity, and are placed properly so you can see the location in the aerial photos in Google Earth. The models are simple enough that they don't tax your computer, but detailed enough to let you get the feel of the stadiums. Nice work OrangeTea! Well it is good but there is a bug i found. The pitch in this Stadium is installed on a kind of huge drawer and can be pulled out of the stadium for benefiting of the sun for the gras quality. Before a game the pitch is pushed inside the Stadium by hydraulic rams. Pretty cool, I liked the graphics. Quite realistic from what I know. 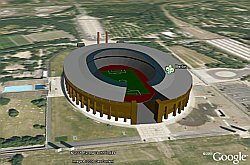 I also found a site, where you can tour the stadiums - 3dgoals.com? they also promise free 3d WC match replays. is this one and the same thing? Does anyone know?